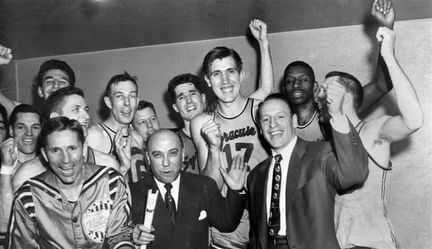 With the NBA struggling financially and down to just eight teams Nationals Owner Danny Biasone and General Manager Leo Ferris suggested the league limit the amount of time taken for a shot thus speeding up a game that often ended with long periods of teams just holding the ball and playing keep away. Biasone calculated a 24 second shot clock would allow at least 30 shots per quarter speeding up the game and increasing scoring. The Shot Clock was an instant success as scoring was up 14 points per game league wide. In the first season of the shot clock the Nats would take first place in the East with a 43-29 record. After a first round bye the Nats would beat the Boston Celtics in four games to reach the NBA Finals for the second straight season. In the finals the Nats would get off to a fast start taking the first two games at home against the Fort Wayne Pistons. However, as the series moved to Fort Wayne the Pistons would spark back to life taking all three games to take a 3-2 series lead. Back in Syracuse for Game 6 on the Nats kept Championship hopes alive by beating the Pistons 109-104 to force a seventh game at home. Game 7 would be as tight as the series as George King sank a free throw to give the Nats a 92-91 lead in the final seconds. King would then steal inbound pass to clinch the NBA Championship for the Nationals.